The T-Fal P25107 Stainless Steel Pressure Cooker is an attractive and durable stainless steel stovetop pressure cooker and steamer that is easy to use. It is an asset to any kitchen. 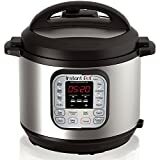 Priced well below $100 (see lowest price) with great reviews, it is a no brainer intro pressure cooker. This pressure cooker can be used on all surfaces, including induction stovetops. It has two pressure settings, 10 or 15 PSI. These settings allow the user the option of selecting a psi that is most appropriate for the food that is being prepared. The pressures cooker is virtually mistake-proof. It includes many safety features including a lid that locks when the unit is pressurized and does not open until the inside pressure diminishes. Another safety feature is a pressure indicator located on the lid that informs the user how much pressure has built up inside the cooker. A variable steam release valve allows the user to discharge steam when necessary for added safety and control. Additionally, the substantial handles on the cooking pot and the lid make the cooker safe to lift and carry. Cleanup is easy with P25107 Pressure Cooker. The cooking pot can be placed in the dishwasher. What about cooking? If you have never used a pressure cooker, you might not know of the many advantages. First, food cooks much faster than conventional cooking. Secondly, a pressure cooker preserves the inherent nutrients and flavor of food. Third, this model, the P25107 Stainless Pressure Cooker can also be used for steaming food. So, you have two functions in one appliance. Finally, the pressure cooker saves you money. You can buy less expensive cuts of meat and still have succulent, tasty meals. Because cooking takes less time, less energy is expended. Your kitchen will stay cooler when there is only the one appliance in use. The T-Fal P25107 Pressure Cooker is perfect for cooking meat. Roast and corn beef can be ready in less than two hours. Tough cuts of meat are tenderized when they are cooked in the pressure cooker. The pressure cooker can also be used to cook beans, vegetables, and even hard-boiled eggs. T-Fal carries the reputation of offering high-quality kitchen appliances for affordable prices and because of this, pressure cookers from this brand are quickly gaining in popularity and are no longer being viewed as an old school and conventional cooking method. Instead, they are being seen as innovative kitchen appliances that offer the user a much faster cooking time and a much easier clean up experience following their meals. Along with the safety features this pressure cooker offers, T-Fal products are also very reliable so you can rest assured that the small investment you make will be well worth it. The T-Fal P25107 Stainless Pressure Cooker Cookware is a stainless steel stovetop pressure cooker that is safe and easy to use. It also has a steamer function. It is the perfect size for most individuals, couples and small families.